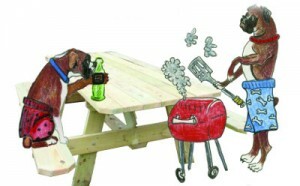 We would like to thank everyone who came out to the Boxers, Brew, and BBQ fundraiser. It was a beautiful day with great food, music, friends and especially some great dogs!! We are happy to report that we raised enough money to cover medical expenses, including heartworm treatment, for at least 25 Boxers! We met our goal and then some!! Thanks to all our donors and volunteers and to everyone who participated in any way. Without you we couldn’t have had such a successful event. Get ready for next year! We are planning already! Check out some pictures from the event here, courtesy of Stacey Warnke Photography.